Nervous moments: The Claremorris subs look on as their side battled back to draw against Aghamore. The first round of the Mayo GAA senior and intermediate championships were played under blazing sunshine over the weekend and threw up a number of surprise results with Hollymount-Carramore's masive 4-15 to 1-6 win over Ballaghaderren one of the stand out performances along with big wins for defending county champions Castlebar Mitchels and Breaffy. The first game of the senior championship took place in Fr O'Hara Park in Charlestown early on Saturday evening and the hosts looked like the were on the way to a surprise win over visitors Knockmore, but when all was said and done, last years beaten county finalists will feel they left this one behind them. Inside the first ten minutes of the game Niall Murphy had hit the back of Aidan Kilcoyne's net to put Paul Jordan's men into a 2-3 to 0-0 lead and the shock looked on. But Knockmore battled back and a goal from the impressive Peter Naughton (who finished up with 1-5 to his name ) just before the half time whistle gave the north Mayo men a foothold back in the game. Four minutes after the restart, Kevin McLoughlin lashed the ball to the back of Kenneth Brennan's goal and it was game one. Knockmore took control of the second half from then on, and Keith Ruttledge hit the leveling score three minutes from time, but there was still time for both sides to miss a few chances to grab the win, but at the final whistle it finished all square at 2-10 a piece. In Garrymore on Saturday evening the All Ireland intermediate champions Westport looked like they were going to make a winning return to the senior ranks until a late Darren Quinn's late goal, put a Garrymore side who had trailed most of the day into the lead. But Westport held their nerve and an injury time free from Alan Kennedy tied things up at 2-7 to 1-10 for both sides to share the spoils. Mark Tierney and Colm Moran hit first half goals for their sides, which Westport led 1-4 to 1-2 at the break. On Saturday evening, Ballintubber did what was expected and picked up two points with a ten point win over Kiltane at home. Cillian O'Connor led the way on the scoreboard with 1-9 of his side total of 1-15 on the day – but only one of those points from O'Connor came from play. When referee Charlie Collins blew the full time whistle in Claremorris on Sunday afternoon, there was a massive feeling of an anti-climax as both Claremorris and Aghamore had to settle for a draw. Both sides will be left wondering how they didn't win this one, Claremorris hit 19 points and Aghamore rattled the back of their hosts net four times in this end to end game. At the interval Aghamore were leading by 2-3 to 0-7 thanks to goals from Robert Lyons and Alan Freeman, with James Shaugnessy's free taking keeping the south Mayo men in the game. The opening eight minutes of the second half saw Aghamore hit the back of the net twice more and look to have the game wrapped up when Freeman hit his second and Sean Og Tighe hammered home the other. Those scores put their side into a 4-4 to 0-9 lead. But Clarmorris battled back with Shaughnessy and leading the way, but it was an over all team effort with ten players registering scores for Claremorris along the way. Colin Gill's point nine minutes form time pulled Claremorris level after a massive effort to reel in the Aghamore men, but just as the looked to have gotten on top of their guests Ross Egan and Freeman kicked two quick points to put Aghamore back in front. However, Claremorris were not for bending and a point from captain Adam Butler up from full back and a late Shaughnessy free – his eighth of the day grabbed a point for John Mulkeen's men. In group for of the senior championship, Castelebar Mitchels eased past Crossmolina Deel Rovers on their own patch running out 2-15 to 1-7 winners. David Stenson did the the heavy listing for Declan O'Reilly's men kicking seven points, while Eoghan O'Reilly and Danny Kirby both found the back of the net with Neil Douglas kicking three points for the county town men. 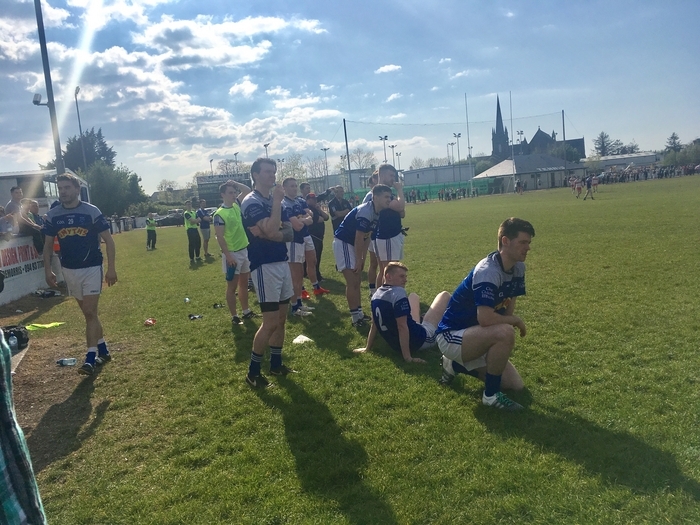 The other game in the group saw Balllina Stephenites head home from Flanagan Park with two vital points in the bag after a 1-11 to 0-12 win over Ballinrobe. The hosts led 0-7 to 1-3 at the break, but Evan Regan's goal not long before the turnaround signaled a Ballina fight back. The second half saw the visitors outscore their hosts 0-8 to 0-5. Regan finished up the day with 1-4 while Darren McDonnell was the scorer in chief for Ballinrobe hitting eight points all from frees.